is done right the first time, every time. American International Aluminum (AIA Metals) is a leading distributor in the international market as well as the domestic metals industry. including trailer manufacturers, tractor components and accessories, brake systems, after-market custom steering wheels, engine and automobile components and more. including transformers, switches, switch plates and covers and electrical contacts. and kitchen equipment including stoves, refrigerators, irons, blenders, etc. including florescent lights and recessed light fixtures and bathroom fixtures. 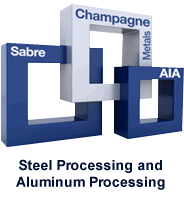 Connecting the US with Mexico is a Strategic Alliance of AIA Metals, Sabre and Champagne Metals. Expect the highest quality on time, every time. AIA observes ISO practices in every aspect of the manufacturing, sales, and customer service process. Provide us with your project specifications, manufacturing process, and the exact end use, and we will produce the right material for the job. If a customer requires a tailored document or packet, we will generate and proof every document before transmitting it to the customer and forwarder. Curabitur sit amet cursus velit, mattis convallis ipsum. Aenean pharetra dolor eu nisi lobortis, ut porta metus accumsan. Morbi tincidunt justo quis ipsum luctus condimentum. Donec varius interdum ante, quis ultrices dui elementum a. Quisque orci odio, venenatis sed aliquet in, ultricies eget magna. At AIA, we take our work personally. We stand by strict standards and quality checks to ensure that our work is done right the first time — every time. back to top © 2013. All Rights Reserved.